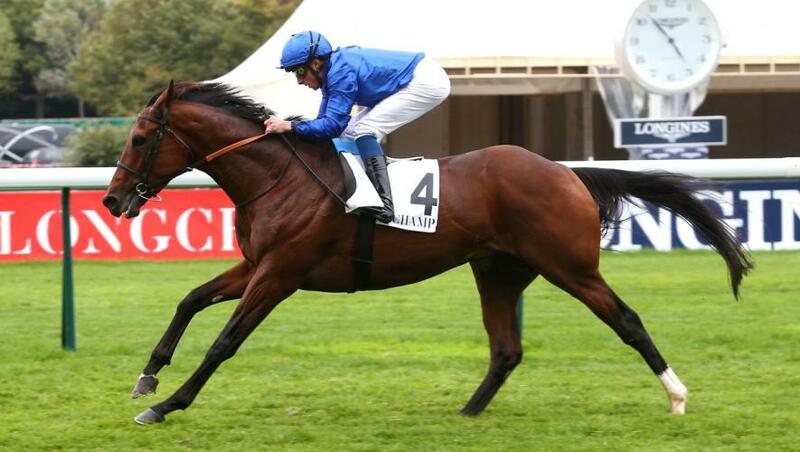 Exciting four-year-old Ghaiyyath features among a four-strong Godolphin challenge for the 10-furlong G2 Prix d’Harcourt, highlight of the opening Longchamp, France fixture of 2019 on Sunday, 7 April. The Dubawi colt is seeking a fourth straight win and returns to the Paris course having gained an easy three-length verdict in the G3 Prix du Prince d'Orange, run over the same course and distance as the Prix d’Harcourt, on his only three-year-old appearance in September. Ghaiyyath (Charlie Appleby/William Buick) recorded two victories over a mile at Newmarket at the end of his juvenile campaign, following up an impressive maiden win with a comfortable success in the G3 Masar Godolphin Autumn Stakes. Nocturnal Fox (Andre Fabre/Mickael Barzalona) is also bidding for a second consecutive Pattern victory, with the four-year-old Farhh colt having stayed on gamely to take the G2 Prix Hocquart over a mile and a half at Chantilly in June. Five-year-old Soleil Marin (Andre Fabre/Pierre-Charles Boudot) was 10th in last season’s Prix d’Harcourt, but returns in excellent form after staying on strongly to beat Magny Cours in the 10-furlong G3 Prix Exbury at Saint-Cloud on Sunday, 17 March. Lucius Tiberius (Charlie Appleby/James Doyle) makes his Godolphin debut after displaying a good level of form in the last year, headed by victory in a valuable 10-furlong handicap at Leopardstown, Ireland, in July. The six runners for the Prix d’Harcourt are completed by Intellogent, winner of the 2018 G1 Prix Jean Prat, and All-Weather Listed scorer Volfango. Charlie Appleby commented: “Ghaiyyath won at Longchamp on his only start last year and has done very well out in Dubai over the winter. “His preparation for this race has gone nicely and he should get conditions to suit. “We could go up in trip with Ghaiyyath at some point, but we feel that a mile and a quarter is ideal at this stage of his career and I am looking forward to seeing him back in action. “Lucius Tiberius showed some decent form for his previous connections last year and has also wintered out in Dubai. Lisa-Jane Graffard of Godolphin added: “Nocturnal Fox was progressing very nicely last year until his campaign was cut short by illness. We hope that he can make an impact in some of the top middle-distance races this season. “This will be his first start for a while and he has a bit to find on the ratings with one or two of his rivals, but we are hoping for a nice comeback race, which should put him on the right path for the rest of the year. “Soleil Marin is in good form at moment and showed a great attitude when taking the Prix Exbury. He lost his way in the second half of his three-year-old campaign, after which he was gelded, and it took him a long time to come back. Longchamp’s card also features the seven-runner G3 Prix La Force over nine furlongs, an early trial for the G1 Prix du Jockey Club, in which three-year-old colt Roman Candle (Andre Fabre/Mickael Barzalona) steps up in class after a comfortably victory in a 10-furlong turf maiden at Deauville in October. Morgan Le Faye (Andre Fabre/Mickael Barzalona) was third at G1 level in both the Prix Royal-Oak and Prix du Cadran at the end of last season and the five-year-old Shamardal mare drops down in class and trip for her seasonal return in the Listed Prix Zarkava over an extended 10 furlongs, in which she faces 11 opponents. Lisa-Jane Graffard explained: “Roman Candle is a very nice and straightforward horse, who has done everything that has been asked of him so far. He made a nice impression when winning his maiden and this will show us where he fits in compared to his peers. “Morgan Le Faye is in great form and we expect her to run well. Running over this trip is a question mark although she was second to a subsequent G1 winner over the same distance in a Listed race at Maisons-Laffitte in July. “Her dam has plenty of stamina, so she has always been campaigned with that in mind, but she possesses a short burst of acceleration. If we can harness that change of gear over shorter distances, it will open up more options.